As a small business, your marketing budget is probably not as big as that of a large corporation. Traditional advertising methods like celebrity endorsed television ads and front-page print ads are likely out of your reach. So you probably use Google ads, PPC, social media, and content marketing to promote your products and services. Adding influencer marketing to your marketing mix is highly effective and can drive impressive ROI. But getting it right is difficult, even for seasoned marketers. You likely have plenty of questions running through your mind. For starters, you need to know how to find the right small business influencers for different campaigns. And you probably want to know if there any insider tips and hacks to make influencer marketing more successful. In this post, you will find the answers to these and other questions. And if you have an ecommerce site, check out our free guide to optimize your Shopify website for influencer marketing. A few years ago, the marketing space was dominated by celebrities and socialites who were heavily paid by brands to endorse their products. This was a major setback for small and medium-sized businesses that didn’t have as deep of pockets as large corporations. Not anymore! Today, micro-influencers often wield more power on social media than celebrities. Check out our free email outreach templates to reach out to potential micro-influencers on various social media networks. Today, the marketing space has undergone a major transformation and is dominated by authentic and passionate content creators. These are everyday people who have built devoted followings thanks to their beautiful content and sincere engagement with their audiences. A micro-influencer is a regular person who knows their niche, is passionate about it, and above all, provides relevant info to their audience. While there’s no hard-and-fast definition of who a micro-influencer is, the general rule of thumb is that any person with a social media following ranging from 1k – 100k is considered a micro-influencer. 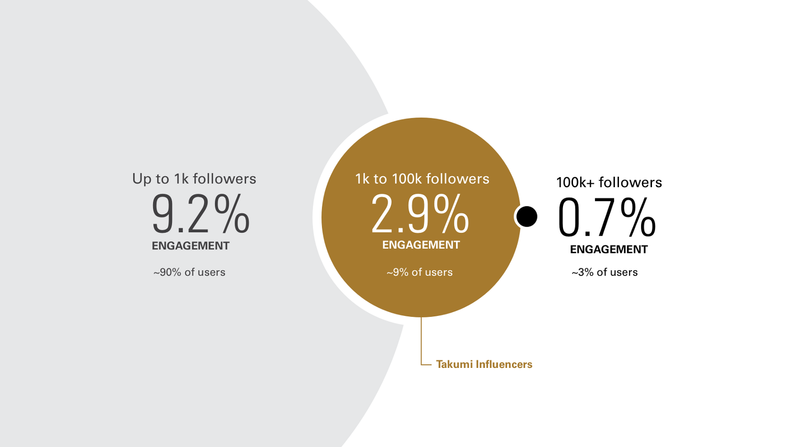 According to a report by Takumi, micro-influencers (people with less than 100k followers) have higher engagement rates compared to celebrities with over 100k followers. The best part about micro-influencers is that they are authentic. For instance, a micro-influencer who is passionate about cooking is not going to post beauty products just for the sake of promoting them. Their audiences feel like they know the micro-influencer personally from their posts, pictures, and videos. This makes the audience more trusting of the products recommended by micro-influencers. This is a huge advantage for startups, and small and medium-sized businesses. By partnering with micro-influencers who are likely to use your products, you can connect with a highly relevant audience, who are most likely to use your products. A survey conducted by Collective Bias found that nearly 30% of consumers prefer buying products promoted by a non-celebrity blogger rather than by celebrities. Only 3% of consumers reported that they would buy a product endorsed by a celebrity. The survey also found that 60% of consumers read reviews on social media or blogs on their mobile devices before making a purchase in-store. Another study conducted by Twitter and Annalect found that 49% of consumers rely on the recommendations of influencers when they make a purchase. A 2016 study by Google showed that a whopping 70% of teenage YouTube subscribers relate to popular YouTubers more than with traditional celebrities. The numbers are sure to have risen in the last two years. These numbers showcase the popularity of influencer marketing among brands as well as consumers. Now you know why you see social media influencers posting photos of themselves drinking their favorite branded green tea or using their favorite camping gear. Getting micro-influencers to do the marketing for you is a smart move on so many levels. You get to connect with an engaged and relevant audience. You can win the trust and confidence of your target audience. And above all, you don’t appear pushy. This is because the micro-influencer is in charge of creating the content in his/her own style. So your marketing campaign doesn’t come across as being advertorial or cheesy. Simply put, consumers love hearing recommendations from other consumers. More so than from celebrities. Micro-influencers don’t fall into the celebrity trap; thereby they have the trust of their audiences. By including several micro-influencers in your marketing campaign, you can spread your marketing budget across multiple influencers. Thereby reaching out to multiple audiences. This helps you generate unprecedented reach and high engagement rates. If you already know which micro-influencers you want to partner with, then congrats! You’ve figured out the difficult part. Don’t waste any time getting them on-board. Use our influencer outreach templates, to ask them to partner with you and get started with your campaigns. If you aren’t sure which micro-influencers will work best for your brand, no worries! We’ve got you covered. Continue reading to find out how to find the right micro-influencers who are a perfect match for your business. In this guide, you’ll learn everything you need to know about hiring small business influencers and how to evaluate them. Without further ado, let’s dive in. With tens of thousands of influencers out there, how do you find the right person to promote your small business? 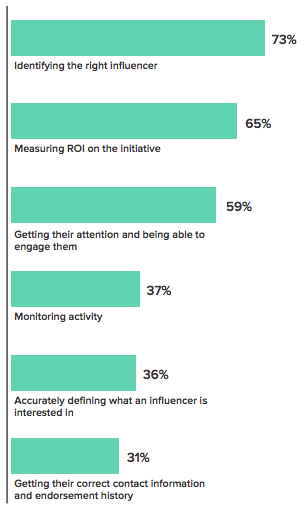 It’s no wonder that 73% of marketers state that finding the right influencer is the biggest challenges they face. The truth is that there’s no such thing as one influencer fits all. There are several factors you need to consider and evaluate while searching for the right small business influencers. The easiest way is to use the help of an expert influencer marketing platform like Grin. Grin not only help you find the right influencers but also take care of the other aspects of your campaign like measuring efficiency, detailed analytics, and more. If you choose to take a more hands-on approach, you need to first determine your goals. What Do You Expect from Your Influencer Marketing Campaign? Before start looking for influencers, you need to decide the objectives of your campaign. What do you want to achieve by partnering with influencers? Your objectives or goals should be the starting point of your influencer marketing campaigns. Once you have figured out what your objectives are, you should define the KPIs you’ll use to measure the success of your campaign progress. This will help you calculate your campaign ROI as well as track the performance of your influencers so that you can use your budget efficiently. Once you have defined your goals, here are the factors that help you choose the right micro-influencers. This is the very first thing you need to consider while searching for influencers. What is the influencer interested in? What drives him or her? Is the influencer into beauty, fitness, health, photography, baking, technology, travel, or a combination of a few of these? The easiest way to find the niche of an influencer is to check out their social media profiles. For instance, by looking at this profile, you can instantly tell that the Instagrammer below is passionate about baking. This Instagrammer, on the other hand, has a more specific niche – Disney parks in Asia. While this is a good starting point, sometimes it may not be easy to determine the niche of the influencer just by looking at their profile. In such cases, you need to take a look at their posts to get a better idea what they post. You can also check out the website/blog of the influencer to find out more about their niche. Why is it so important to find influencers in your niche? The simple answer is – relevancy. You need someone who is highly relevant to your business. For instance, if you’re a home décor consultant, then collaborating with a travel influencer or a food blogger won’t make much sense to you. A lifestyle blogger who is interested in home interiors will be a better match for you. Additionally, collaborating with an influencer from your niche means that you gain access to a highly relevant audience. This way, you have higher chances of converting them. As you can see in the following example, Booksaremybag has partnered with BooksandQuills, an influencer who’s into books, travel, and food. This campaign worked well for the brand because the audience of the influencer matched the target audience of the brand. When this post is seen by the followers of Booksandquills, there are higher chances that they may purchase the bag shown here, since they too are book lovers. So, the first step in finding the right micro-influencers for your brand is to check whether their niche matches with yours. This is the holy grail of influencer marketing. Engagement rate is one of the most important factors to consider while selecting influencers. Why? Because it’s an accurate indication of how many people are interested in the content of the influencer. So, what exactly is engagement rate? Simply put, it’s the percentage of followers who react – like, share, comment – to the influencer’s posts. To calculate the engagement rate, you have to look at the last 20 to 30 posts of the influencer. There are also several free tools that can help you calculate the engagement rates. Alternatively, you can also use specialized tools like the online engagement calculator from Grin. But how do you know whether your influencer has a good engagement rate or not? Take a look at this study from Influence.co. You can find the average engagement rate for influencers based on their vertical, in the chart given below. If your prospective influencer has this rate (or higher), then you know you’re making the right choice. Apart from the numbers, there’s another crucial factor to consider – the quality of engagement. A good way to determine the quality of engagement is by taking a glance at the comments on their posts. For instance, take a look at this post from TheDadLab. He has posed a question to his followers and a ton of them replied with their input. There are actual conversations and discussions happening in the comments section of the post. You need influencers like him, who add value to your brand and enjoy a good rapport with their audience. As a small business, where every marketing penny counts, choosing influencers with high engagement rates ensures that you get the most for your bucks. While we believe that follower count shouldn’t be your sole criteria for choosing influencers, you cannot fully ignore it. Why? Because follower count plays an important role in determining how many people will get to see your posts. To arrive at this metric, you start by measuring the influencer’s reach on his/her blog. This can be determined by the number of subscribers to the blog. Then, you’ll have to find out all the social media sites they are active on. You can combine their total follower count across social media sites. The total reach is the sum of the above two numbers. Figure out the total reach of all the influencers on your shortlist and then compare. This metric can sometimes be surprising. An influencer with an average performance across social media networks can easily perform better than another influencer, who has a stellar presence on one platform, and poor or zero presence on others. However, use this metric with caution. As you know, “Numbers don’t present the complete picture.” Celebrity influencers may have a larger total reach but poor engagement rates. According to a study by Influence.co, as the follower count of the influencer increases, the engagement rates decrease. As you can see, influencers with less than 2000 followers have the highest engagement rates, whereas influencers with the most followers (over 1 million) have an engagement rate of just 1.5%. Look for influencers who are well connected and enjoy a good rapport with their audience. The ultimate aim for your brand is to reach many people as possible, while keeping it real and authentic. Essentially, you need to look for influencers whose influence span across several networks. Don’t just depend on blog traffic. For instance, an influencer may have poor or mediocre followers on their blog but may have a great reach on social media networks. It all depends on where your target audience is. For instance, if your target audience is mostly on Instagram, then look for influencers who have a large follower count and high engagement rates on this platform, to kick start your influencer marketing campaign on Insta. Here’s a list of the global social networks ranked by the number of users, courtesy of DreamGrow. Once you have identified influencers with a presence across multiple channels, you have to decide whether you want your marketing campaigns to be published on several leading social networks, or if you want to focus on just one network. According to a survey by Bloglovin, 89% of micro-influencers post content on a blogging platform like – WordPress, Tumblr, Blogspot, Squarespace, and/or Medium. The same survey reported that 80% of all micro-influencers surveyed stated that Instagram is the preferred platform for posting original content. Links cannot be used to reference anything in bio or descriptions. Business profile gets less organic reach. This is just the starting point. You can use this list to evaluate different social media networks to identify the ones that will work best for your brand. One of the biggest benefits of influencer marketing is that it helps you reach your target audience more efficiently. Instead of shooting in the dark, you can reach people who are most likely to convert. For the best results, select influencers whose audience demographics match those of your target audience. To do this, figure out the ages, genders, locations, income levels, marital statuses, and other attributes of your most profitable customer segments. The next step is to look for influencers whose audience demographics match yours. If your brand targets a specific location, then you might want to look for local influencers in that area. For example, if you own a gym, then you should look for fitness influencers in your city. Take a look at these influencers from Wilton – thePieous, Magnolia Bakery, Baking with Blondie. All three are influential bakers who have huge fan followings. By partnering with them, Wilton was able to promote their products to the right target audiences. You need to do thorough research about each influencer before partnering with them. For instance, if you’re promoting Coca-Cola products, then partnering with an influencer who has shown a liking for Pepsi products in the past likely won’t be effective. Another example is for a travel agency promoting cruises to partner with an influencer who has in the past mentioned that flying is her preferred mode of travel. The point here is to invest some time and take a thorough look at the past content shared by the influencer. If you spot any disconnect, or if they’ve promoted your direct competitor in the past it may be better to avoid the partnership rather than end it on a sour note. And, sometimes you may even find that the influencer has previously mentioned your brand in a positive way (this occurs if you target influencers in your niche). Ultimately, the success of your campaign rests on the content created and shared by your influencers. This is one of the most important factors to consider while choosing an influencer for your small business. Their aesthetics, voice, and style needs to align with those of your brand. Look for influencers who have high-quality content. An influencer with a high engagement rate, massive reach, and a large follower count might not be a good partner for your business if their content style and values don’t match yours. For instance, if you have a quirky brand that targets young millennials, then perhaps an older influencer who has a more serious, professional voice, or one who doesn’t create videos won’t be a good fit. Ensure that the quality of work and aesthetics of the influencer match your brand, before you reach out to them. Make sure you go through their posts. If you aren’t able to check all of the posts posted by the influencer, make sure to review at least posts from the last 3 to 6 months. One thing you have to watch out for is over promotion. Is the influencer promoting way too many brands? If so, you need to reconsider, because over-promotion often dilutes the authenticity of their content. You can clearly identify if an influencer is over promoting by taking a look at the comments. If the readers feel that the influencer is not offering anything of value to them, but just promoting one brand after another, then its better not to partner with that influencer. For example, take a look at the blog of this travel blogger. As you can see, out of the four posts displayed on the home page, three are for credit card promotions and sponsored posts for hotel and airline loyalty programs. This is a classic example of over promotion. It doesn’t offer much value to a travel enthusiast looking to explore new places. Make sure that you do a comprehensive quality check before bringing influencers on board. Don’t let numbers tempt you, do your research. It may be tempting to pick the influencer with the largest number of fans. After all, the more, the merrier, right? Not always! Just because an influencer has a large number of followers doesn’t mean that they wield impressive persuasive powers. Before you blindly choose the first influencer you come across, make sure that you spend some time doing your homework. Take time to understand the metrics outlined above. Evaluate the analytics and make sure that the influencer’s audience and style match your brand’s personality. Can you think of any other metrics that help to identify the right social media influencers for a brand? Let us know in the comments below.